This workshop will focus on a more contemporary approach to Scottish fiddle music, exploring the use of ornaments and bowings to bring the tunes (one or two we will learn) to life. Students should bring a recording device of some kind. The class will be taught completely by ear. *For players intermediate and above (need not have Scottish fiddling experience). "Exuberant and rhythmic, somehow both wild and innocent, delivered with captivating melodic clarity and an irresistible playfulness," says the Boston Globe about Hanneke Cassel's playing. Such charismatic fiddling has brought the native Oregonian many honors and awards. 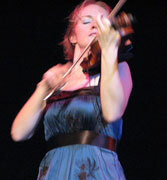 She is the 1997 U.S. National Scottish Fiddle Champion, she holds a Bachelors of Music in Violin Performance from Berklee College of Music, and she has performed and taught across North America, Europe, New Zealand, Australia, and China. She teaches regularly at Alasdair Fraser's Valley of the Moon and Sierra Fiddle Camps, Boston Harbor Fiddle Camp, Mark O'Connor's fiddle camp, and the Club Passim School of Music. For more information, email: andrea@freightandsalvage.org or call 510-644-2020 ext. 127. Advance registration is recommended to assure space.